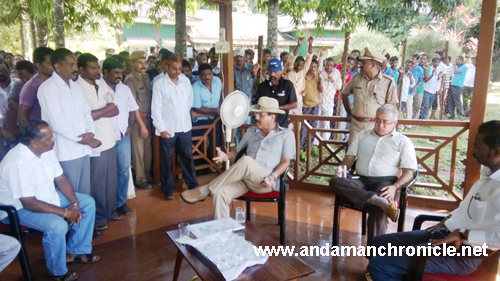 Port Blair, Nov. 30: The Lt Governor, Lt Gen (Retd) A. K. Singh, visited Long Island on 30th Nov. 2013. On his arrival at the island, the LG was received by the Pradhan and other members of Long Island, along with the member of Zilla Parishad of Long Island, Pradhan of Sabri Panchayat and other members of Panchayat. At Long Island, the Lt Governor held a meeting with representatives of Panchayati Raj Institutions and officers of the Departments. During the meeting, the problems faced by the people such as absence of rural roads, absence of Allopath Doctor at the local health centre, repair of RO Water Treatment Plant, non-availability of seats in ferries and other problems were discussed. The LG was also apprised about the tourism potential of the Island. However, due to lack of facilities the potential has not been exploited. In this regard the LG has asked the Pradhan to work-out a proposal for tourism development and submit the same through the Deputy Commissioner. The Lt. Governor later took a round of the Guest House, PHC, school, playground and also the seafront to see the necessity of the sea wall. Specific directions were also given on various issues and deadlines set for the completion of works, some of which have been pending for many years. Chief Secretary, Shri Anand Prakash, Secretary to LG, Shri S. N. Misra, Deputy Commissioner (N&M Andaman), Shri Sanjay Kumar and Chief Engineer, APWD, Shri P. K. Singh accompanied the Lt Governor during this tour. Having visited the Island, the Lt. Gov. AK Singh through his social media account communicated that his visit to Long Island was interesting for reasons more than one. He also said that the pristine beauty of the island can be harnessed and there are many issues which have been languishing for years.